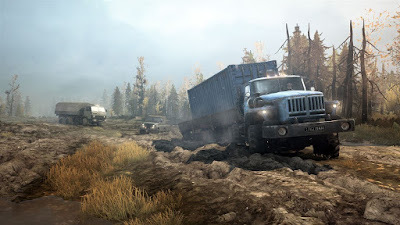 Playing with trucks in the mud was my go-to pastime as a little kid so it is no surprise that I’d fall in love with a game like Spintires: MudRunner as an adult. Not only does Spintires: MudRunner appeal to the same part of me that loves playing in the mud, but it tickles the same parts of my brain that make games like Farming Simulator and Elite: Dangerous so fun and satisfying. I don’t mind a grind in a game as long as the end result is worth it whether that means harvesting acres of crops, sitting in a hyperspace jump for hours, or slowly crawling back around through the mud in a Russian logging truck. There is just something immensely rewarding about games like this that I can’t get enough of and Spintures: MudRunner is right up there among the best of them. Continue reading my full Spintires: MudRunner Xbox One review for all of the details. 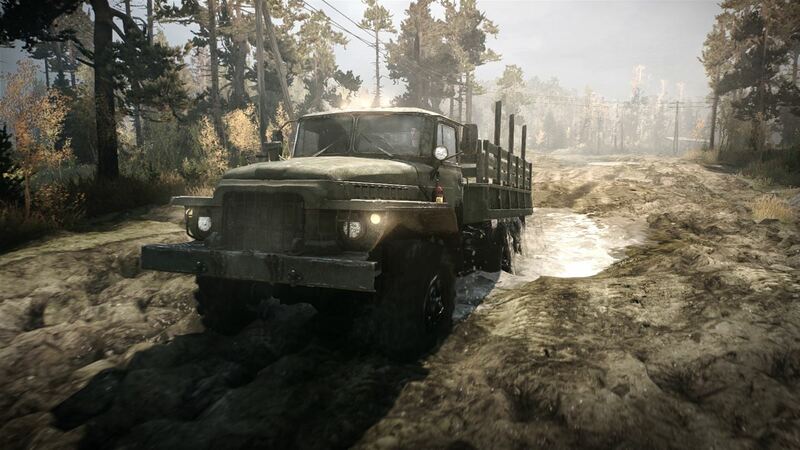 In Spintires: MudRunner you are a driver that has to drive big bukly Soviet-era trucks around the muddiest, boggiest, murkiest corners of Russia to deliver fuel and logs to the outposts scattered around each region. There are six large open world sandbox maps, nine challenges that task you with doing specific things, and 15+ vehicles to choose from. You can also play in up to 4-player co-op on Xbox Live / PSN. Spintires: MudRunner is a simulation-style driving game where you slowly drive big all-wheel-drive vehicles through the mud. It isn’t 100% realistic, though, because as we’ve seen with a lot of other “Simulator”games, these type of games have to meet a fine balance or else they can get too slow and too boring and aren’t fun. Instead, Spintires: MudRunner hits that sweet spot where its enough of a sim where you have to do things like manually switch to all-wheel drive and lock the differential (so the wheels all turn at the same speed rather than all the power going to the one wheel of least resistance), and the physics are realistic enough you’ll bounce off of rocks and the tires will slip on different types of terrain, but it isn’t so much of a realistic sim that you’ll bury your truck in 4-feet of mud and have to wait until Summer for the mud to dry so you can jackhammer it out. Which is what happens in the real world. It hits a nice balance so it’s actually fun. When you start a sandbox map you’ll have an objective like delivering X amount of wood to a lumber mill. That means you have to first equip your truck with the proper equipment, then drive to the forest to pick up the logs, then drive back to the lumber mill to deliver them. As mentioned, the only problem is that there is a mile of muddy road between each point. The maps are totally open world, though, and are full of alternate paths – including driving offroad and making your own path – and oftentimes the fastest route is actually not the most straightforward. Another thing that makes the game fun is that it isn’t simply about driving one truck from point A to point B. You’ll have access to multiple trucks on each map (instantly switching between them is easy via the menu) and making efficient use of all of them is important. You can haul “garage points” to far off outposts to build yourself a new garage closer to the lumber mill to make it easier to equip your trucks with the proper setups. You might need to use one truck as a fuel carrier to refuel your other vehicles or a repair truck to fix them when they take too much damage. You can also drive smaller Jeep / Land Rover-type vehicles to scout out roads and paths or reach watch towers that reveal more of the map. Sometimes you’ll actually get stuck somewhere, too, and will need to use your winch (with wonderfully easy controls) or even use one truck to pull another truck out of the muck. Each sandbox you play in has lots and lots of moving parts, which is a ton of fun. It has to be noted that the controls are not entirely intuitive, however. The menus are sort of clunky and obtuse – especially those for equipping stuff, loading and unloading, etc. – but you figure it out pretty quickly. The steering is also a little fidgety at first because the wheel doesn’t auto center like it does in most driving games, so you constantly have to be mindful of what direction your wheels are pointed or else you might veer suddenly and violently off to the side when you regain traction. Moving the camera around to keep an eye on your front wheels is more important than being able to see far in front of you, which isn't intuitive at first. At first the camera seems sort of unwieldy and not optimal – you don’t really ever get a “good” view, honestly – but you can move it around freely and zoom in and out and eventually figure out the best ways to use it in order to work efficiently. All in all, though, when you figure out how to do everything Spintires: MudRunner is an absolute blast to play. It is just so incredibly satisfying because you work for every foot of ground you cover and every item you successfully deliver. The crazy thing is that you aren’t even earning in-game money or working along a story path, you’re just doing work for the sake of using big cool machines in the mud and doing work. Some folks might find that boring, but I love it. I loved it when I was 4, and I still love it at 34. One word of warning, though – This game can be a massive time sink. It can take a couple hours (or more) to finish a sandbox map and, despite your actual movement speed being very slow, real time seriously flies by. You can lose yourself for hours upon hours here. 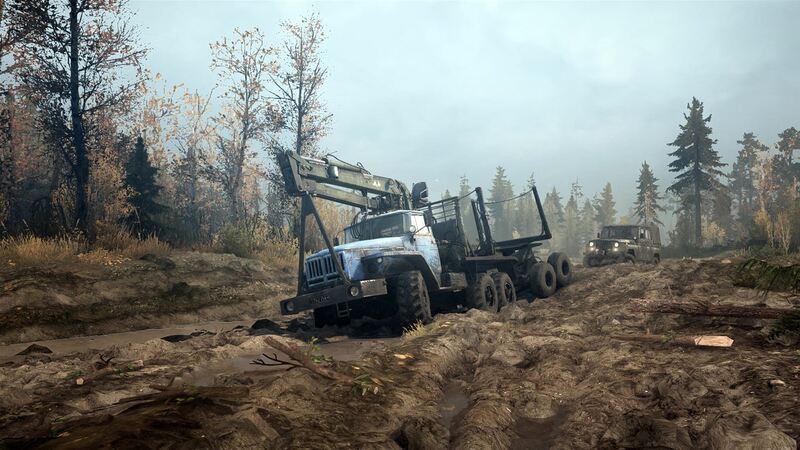 The presentation in Spintires: MudRunner is a bit up and down. The environments are largely depressing gray and brown rocks and mud that, while decently realistic, isn’t much to look at. I also have to say that the mud itself – easily the most important thing in the game – doesn’t look that great. It’s just sort of big globby chunky stuff instead of squishy slimy muddy mud. The sound also isn’t particularly noteworthy. The trucks all sound the same and there isn’t much music to speak of so the audio is largely just the groaning of your engine and maybe some bird sounds. In the end, your enjoyment of Spintires: MudRunner comes down to how much you enjoy playing in the mud, and how long you can tolerate games that most folks would consider a boring grind. I happen to love it and think that anyone else that enjoys immensely satisfying and rewarding sim-style games will love it too. 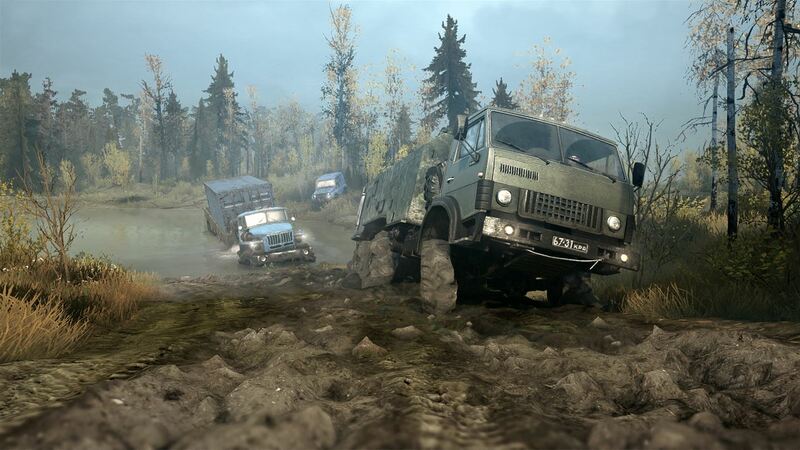 Spintires: MudRunner is well worth a look. Buy it.